Naturally Awesome fact! After the bread is cooked the sand brushes off easily. In the Sahara flat bread is the staff of life. Flat breads are perhaps the oldest kinds of bread. It is likely they are among the oldest of all cooked or baked goods we have anywhere. It’s unique because it is made without yeast and yet is soft and pliable. Wheat, rye, and barley are some of the flours that are used. 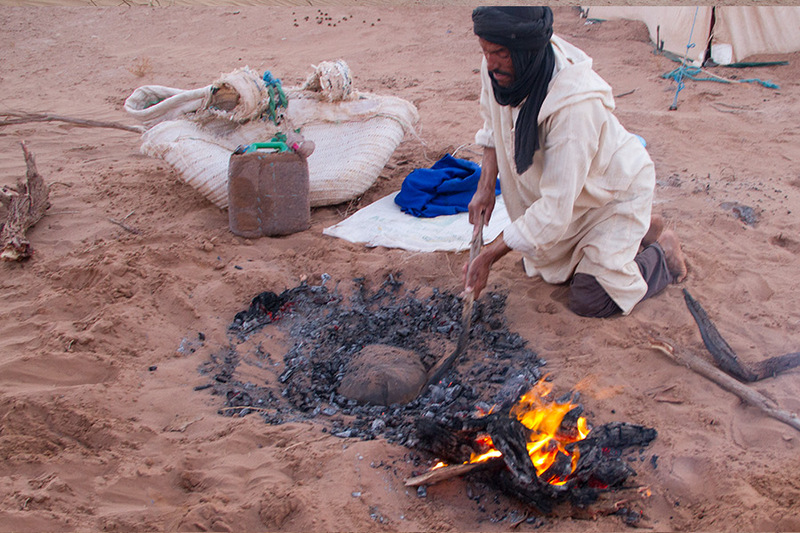 The Sahara Nomads use an exceptionally low-tech and fuel-efficient baking method. A hole about 12 inches deep is dug into the desert sand and a wood fire is lit in the bottom and burned down to charcoal. The coals must be extremely hot and must burn long enough to heat the sand underneath. Using a stick the coals are pushed into a circle. The dough is quickly placed in the center of the hot sand. 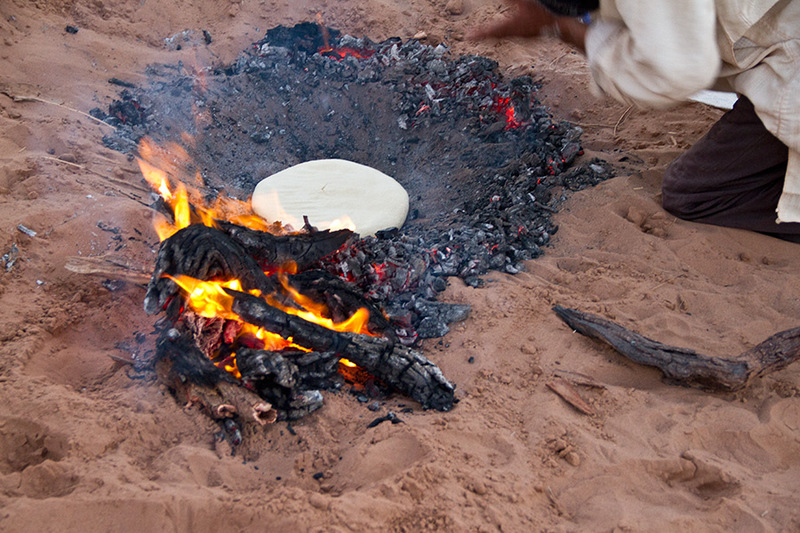 A stick is then used to cover the bread with the sand and coals. This process must be fast so that the temperature doesn’t drop. The temperature is so hot that the bread begins to bubble almost immediately underneath the sand and coals. The bread can be seen rising and cooking as it pushes the sand covering upward. When the bread is baked, the sand is pushed aside and the bread is lifted out and the excess sand is brushed off. 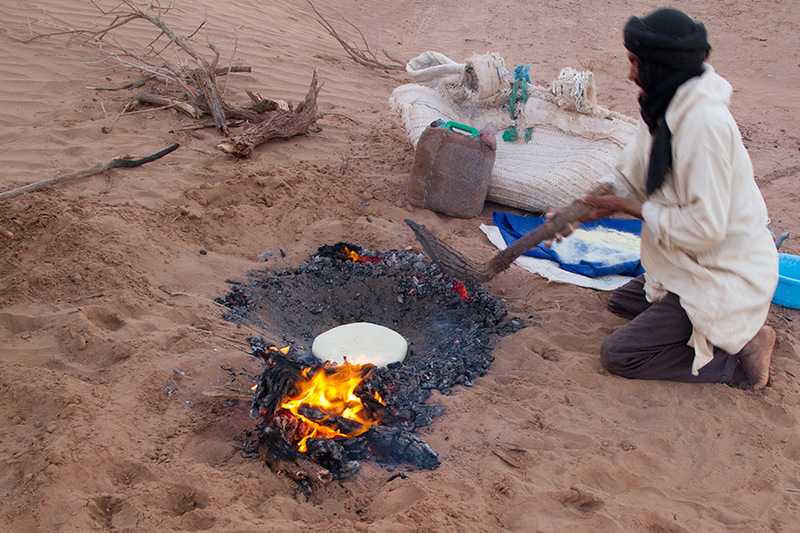 Creating something so simple, using very basic ingredients and cooking techniques, is typical of nomadic life in the desert where everything out of necessity is very basic.